I went straight from work to gather my stuff for the show last night, so no inner hippie ideas today, but did notice the new holiday decor at the Caribou Coffee near my house last night and thought it was worth a share. Caribou's woodland theme screams to be a hybrid Target plasticized rip on Susie G's critters while Starbuck's paper cut lettering and graphics are a less-soulful, nearly identical twin to Rob Ryan's poetic and thoughtful compositions. I think it's only fair to admit I've worked for both companies, and can't ever see myself setting foot in a Caribou ever again. Because the dry heaves start when I step within a 50 foot radius of one of their stores, the images for Caribou were found online here and here. 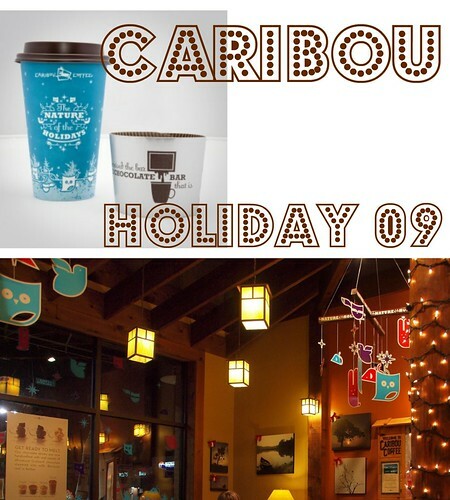 The Starbucks images are from their online holiday shop.